Now that we're past the 2017 WCET conference and headed to the EDUCAUSE conference, let's look at updates on the institutional LMS market for North America (US and Canada). Last year we started our LMS market analysis service, where we are working with LISTedTECH to provide market data and visualizations, and our fall report for subscribers will be released in about a month. Data for 2017 presented below goes through October 1 of this year. We present the data "by institutions", with market share as a percentage of the total number of institutions using each LMS as a primary system, and "by enrollments", where we scale the institutions by their total enrollment. The latter better captures the business of the LMS market, since most licensing deals are based the number of students. We have also included data from Fall 2016 by institutions for comparison purposes. In terms of new selections the market continues to be a two-horse race recently with Canvas by Instructure and Brightspace by D2L as the only two solutions with material gains in market share. Canvas grew from 17% to 21% , and Brightspace from 11% to 13%, of the market. Outside of the big four - Blackboard Learn, Canvas, D2L Brightspace, and Moodle - no other system has more than 3% of the market measured either by percentage of institutions or percentage of enrollments. Furthermore, the category of "Others", capturing systems not listed above and having less than 1% market share, actually dropped from 4% to 2% of the market. This indicates that continued market consolidation. Schoology and BNED LoudCloud grew slightly, but not nearly to the degree of the Canvas and Brightspace. Blackboard Learn fell the farthest, from 31% to 28% of of the market. The second biggest drop was Pearson LearningStudio, from 4% to 2%, based on its end-of-life notice for December 2017. Moodle and Sakai both lost market share of just under 1%, not enough to show up in the rounded numbers in the table but enough to show up in our underlying data. The difference in Moodle's market share by institutions at 25% and by enrollments at 12% really shows how concentrated their usage is for smaller schools. When viewing market share as defined by percentage of enrollments, Blackboard and Canvas are the most-used systems, at 37% and 27% of the market, followed by D2L at 15% and Moodle at 12%. 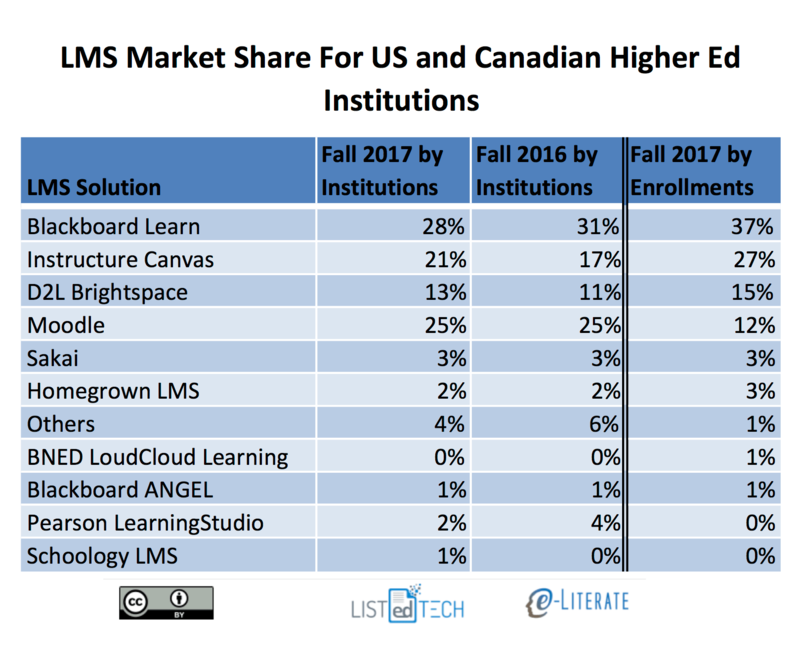 Stepping back from the immediate data, let's look at an updated LMS market share graphic, commonly known as the squid graphic, for US and Canadian higher education. The original idea remains – to give a picture of the LMS market in one page, highlighting the story of the market over time. The key to the graphic is that the width of each band represents the percentage of institutions using a particular LMS as its primary system. Blackboard and Moodle have been the market leaders as number one and two in share as they have been for the past decade. However, Canvas is quickly approaching Moodle's market share. We'll share any updates we discover at the conference this week.